Within Temptation have released a video for their new single Supernova. The track features on the band’s latest album Resist, which came out last week through Spinefarm Records. The spectacular sci-fi video was created by Set Vexy, with Wesley Versteeg providing the visual effects and it can be watched below. Speaking about the follow-up to 2014’s Hydra, the band said in a statement: “After two decades, Within Temptation is ready to break with the past. 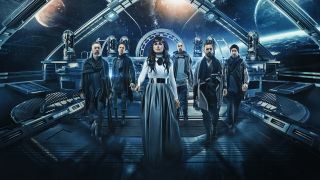 “Within Temptation has never been bounded by frontiers but by expanding their horizon, the band gave its creative writing process a new blast. And you can tell – the new sound of Resist cuts through the very first, bombastic single The Reckoning featuring Jacoby Shaddix, and leaves you with no room to breathe. The band will head out on a North American tour later this month.